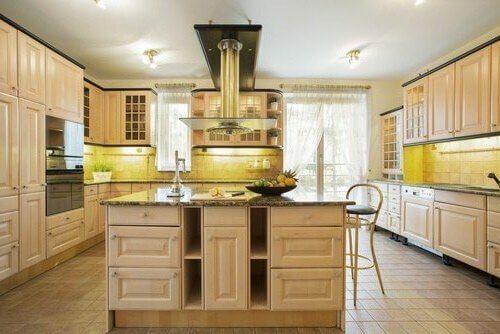 The kitchen can be one of the most cramped spaces in your house. Who couldn’t use more surface space for preparing foods? There are some creative ways to incorporate DIY islands into the kitchen so you increase your work space significantly. These do-it-yourself projects don’t require you to be incredibly crafty. They are just ingenious ways to create more space. Transform an old dresser you are no longer using or one you picked up at a flea market and use it for a kitchen island. Try to use a dresser the same height as your countertops. If the dresser is not quite tall enough, recycled table legs can be used to replace them and make it taller. Paint the piece a color that matches the rest of the kitchen’s décor and remove the hardware so it can be spray painted and then reattached. If you prefer, you can purchase new hardware, but typically the original hardware adds a tasteful touch. Replace the top of the dresser with a piece of wood that has been painted white or with a countertop. Combining two or three bookshelves can create a kitchen island with tons of extra open storage. To make certain they are secure, connect them using particleboard screws and also to the floor using cleats. A butcher block can be used along the top to create a countertop, and bead board can help give it a uniform appearance. Adding some trim underneath the countertop can provide a finished look. For those who would like to create a movable island, try sprucing up an old desk. After removing the hardware, sand the entire surface of the desk then paint it a complementary color for your kitchen. Once the paint has dried, reattach the hardware or replace them with silver pulls. Make your workplace movable by adding wheels to the legs and add Formica to the top to create a workable countertop. For the rustic kitchen, try using an old workbench for increasing workspace. This may take the least amount of work to get it ready to use. It won’t require any assembly, and new knobs can be added to the drawers. Spray paint the entire piece to get the look you want. The original workbench top can be sanded and stained and used as a wooden countertop. This is the easiest DIY kitchen island possible. You don’t have to use an old piece to create a kitchen island. A simple butcher block cart can easily be transformed into a workspace. If you want to spruce it up, paint it a bright color and change out the drawer pulls. It’s not difficult to create your own kitchen island and make this busy room easier to work in. Add more countertop space and storage with just a simple addition.